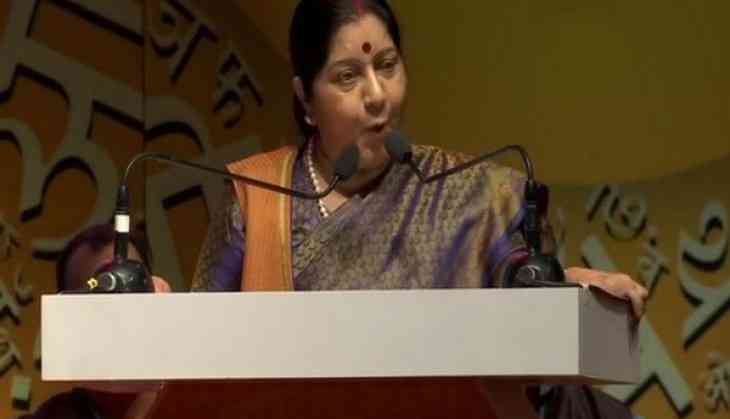 External Affairs Minister (EAM) Sushma Swaraj, along with Uttar Pradesh Chief Minister Yogi Adityanath on Saturday inaugurated the website for the 15th Pravasi Bharatiya Divas 2019, commencing the online registration for participation in the now biennial event. Addressing the media, the EAM said, the theme of the upcoming convention will be the 'Role of Indian Diaspora in building a New India'. "We will discuss how they can contribute towards cybersecurity, affordable alternate energy sources like solar power, etc. The recommendations that will be made during the convention will be taken up by the respective ministries for its implementation," she added. "In reverence to the sentiments of the larger diaspora community to participate in Kumbh Mela and Republic Day celebrations, the 15th Pravasi Bharatiya Divas will be held from January 21 to 23, 2019 instead of January 9, which is observed as the Pravasi Bharatiya Divas to commemorate Mahatma Gandhi's return from South Africa on the same day in 1915," an official government statement read. The convention will be held at Varanasi, Uttar Pradesh. After the convention, participants would be given the opportunity to visit Prayagraj for Kumbh Mela on January 24 and witness the Republic Day Parade at New Delhi on January 26. On January 21, the inauguration of the Youth Pravasi Bharatiya Divas will be held in partnership with Ministry of Youth affairs and Sports. Government of Uttar Pradesh will also organise the State PBD - 2019 on the same day. On January 22, Prime Minister Narendra Modi will inaugurate the Pravasi Bharatiya Divas Convention and January 23, the Valedictory Address will be delivered and Pravasi Bharatiya Samman Awards will be conferred by President Ram Nath Kovind. Prime Minister of Mauritius Pravind Kumar Jugnauth will be the Chief Guest of the Convention. Member of Parliament of Norway Himanshu Gulati will be the Special Guest and Member of Parliament of New Zealand Kanwaljit Singh Bakshi will be the Guest of Honor at the Youth Pravasi Bharatiya Divas. Pravasi Bharatiya Divas Convention a flagship event of the government, provides an important platform to engage and connect with the overseas diaspora.